Breathing life into the country’s flagging cashew nut industry. A DECLINE IN TOURISM AND FALLING YIELDS ARE PUSHING MORE PEOPLE IN COASTAL KENYA INTO POVERTY. THESE CHANGES ARE HITTING YOUNG PEOPLE HARD; THE COUNTRY HAS THE HIGHEST LEVEL OF YOUTH UNEMPLOYMENT IN EASTERN AFRICA. Thousands of smallholder farmers along Kenya’s coastline produce cashew nuts. However, ageing trees and insufficient investment have seen cashew production in the area decrease, weakening an already fragile economy. Deliver training in agricultural best practice to 15,000 farmers so that they can become certified organic cashew and sesame farmers, and command higher prices. Establish two cashew seedling nurseries to revitalise ageing stock. Train farmers to plant sesame crops between the cashew trees to optimise land use and diversify income streams. 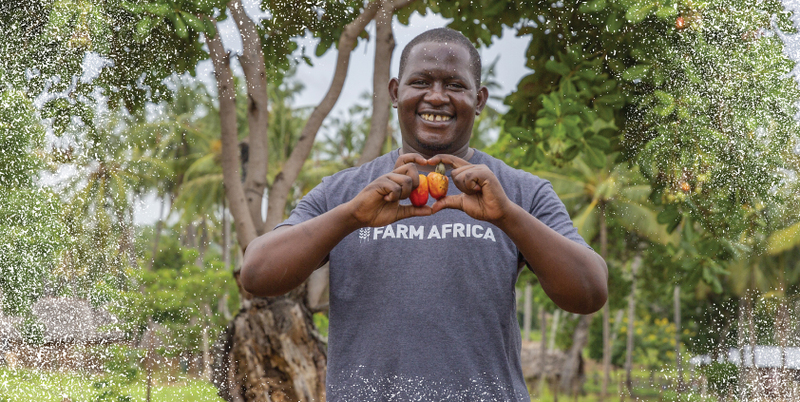 Help farmers gain access to the funds they need to grow their business by connecting them to financial institutions and setting up saving groups. Help 1,000 young adults create their own jobs running agribusinesses providing cashew nut farmers with commercial services, such as tree surgery and access to fertilisers. Help farmers increase the productivity of their cashew trees by grafting branches from higher yielding varieties of trees onto their existing trees. Set up a cashew nut processing factory with a capacity of 2,400 metric tonnes a year, creating over 500 jobs.